I just returned from my more-or-less annual visit to my folks in Naples, Fla., and after six days in the sun, I’m ready to face down the rest of winter. The weather this winter has been cool in southwest Florida, just like the rest of the country. You can see marks of it on the edges of leaves that clearly were nipped by frost. Many blooming plants are behind their usual schedule as well. Despite that, it was great to see the tropical hibiscus, palm trees, blooming bougainvillea, and the lush pots of annuals that are everywhere. 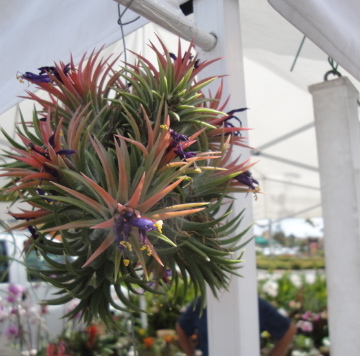 During a trip to a small farmers’ market near Estero, my mom and I happened upon a vendor of air plants, which are more formally known as epiphytes. These tropical plants do not require soil to grow. After my mom mentioned that I edit a garden magazine (hey, she’s my mom! ), we got a short tutorial on these unusual plants, which are part of the large bromelliad family. According to the vendor, there are 10,000 varieties of bromelliads, divided among many genus and species. The air plants belong to the genus Tillandsia. Unlike other plants, they absorb water only through their leaves and are able to gather nutrients from the air itself and from the dust and other particles carried in air. The plants have roots, but they are strictly used for latching on to trees, logs, and other anchors. The plants come in a wild assortment of leaf shapes, colors and forms. They are native to Mexico and other parts of Central America. It’s only in the past few years that breeders have gone into the jungles to collect some of the more unusual varieties. Because of growing interesting in tropicals, breeders are developing new types all the time now. After our talk with the vendor, my mother mentioned that air plants were incredibly common in her neighborhood. Sure enough, on a walk later that day, I spotted dozens of air plants clinging to branches, pruning cuts, and trunks, drinking in the warm Florida air, just as I was.